"Alternative facts" was a phrase used by U.S. Counselor to the President Kellyanne Conway during a Meet the Press interview on January 22, 2017, in which she defended White House Press Secretary Sean Spicer's false statement about the attendance numbers of Donald Trump's inauguration as President of the United States. When pressed during the interview with Chuck Todd to explain why Spicer would "utter a provable falsehood", Conway stated that Spicer was giving "alternative facts". Todd responded, "Look, alternative facts are not facts. They're falsehoods." Conway's use of the phrase "alternative facts" for demonstrable falsehoods was widely mocked on social media and sharply criticized by journalists and media organizations, including Dan Rather, Jill Abramson, and the Public Relations Society of America. The phrase was extensively described as Orwellian. Within four days of the interview, sales of the book 1984 had increased by 9,500%, which The New York Times and others attributed to Conway's use of the phrase, making it the number-one bestseller on Amazon.com. Conway later defended her choice of words, defining "alternative facts" as "additional facts and alternative information". 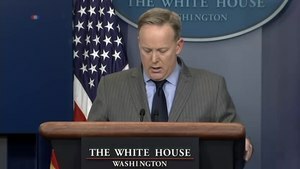 On January 21, 2017, while White House Press Secretary Sean Spicer held his first press briefing, he accused the media of deliberately underestimating the size of the crowd for President Trump's inaugural ceremony and stated that the ceremony had drawn the "largest audience to ever witness an inauguration – period – both in person and around the globe". According to rapid transit ridership data and photographic evidence Spicer's claims and allegations were false. Aerial images showed that the turnout for Trump's inauguration was lower than the turnout for the 2009 inauguration of Barack Obama. Spicer claimed that 420,000 people rode the DC Metro on inauguration day 2017, compared to 317,000 in 2013. He did not offer a source for his claim, or clarify the time periods being compared. Actual ridership figures between midnight and 11 AM were 193,000 in 2017, 317,000 in 2013. Full-day ridership was 570,557 in 2017, 782,000 in 2013. Spicer also gave incorrect information about the use of white ground coverings during the inauguration. He stated that they were used for the first time during the Trump inauguration and were to blame for a visual effect that made the audience look smaller. The white ground coverings, however, had been used in 2013 when Obama was sworn in for the second term. Spicer did not take questions from the media at the press briefing. Trump's campaign strategist and counselor, Kellyanne Conway, defended Spicer's statements in a Meet the Press interview. In response to a question from Todd about Trump's false claims and the loss of credibility, Conway said, "Our press secretary, Sean Spicer, gave alternative facts to [these claims], but the point remains that..." Todd interrupted her by saying "Wait a minute. Alternative facts? ... Alternative facts are not facts. They're falsehoods." In her answer Conway argued that crowd numbers in general could not be assessed with certainty and objected to what she described as Todd's trying to make her look ridiculous. Two days later, Spicer corrected his statements concerning the WMATA ridership levels, stating that he had been relying on statistics "given to him". He stood by his widely disputed claim that the inauguration was the most-viewed, stating he also included online viewership in addition to in-person and television in his figures. During the week following Conway's comments, she discussed "alternative facts", substituting the phrases "alternative information" and "incomplete information". Two days after the Todd interview she defended Trump's travel restrictions by talking about a nonexistent "Bowling Green massacre" (she later said she was referring to the arrest of two Iraqis in Bowling Green, Kentucky, for sending aid to insurgents in Iraq), and by falsely claiming that President Obama in 2011 had "banned visas for refugees from Iraq for six months". Her false statements were described as having "taken 'alternative facts' to a new level". The phrase "alternative facts" was claimed to be similar to a phrase used in Trump's 1987 book, Trump: The Art of the Deal. In that book, "truthful hyperbole" was described as "an innocent form of exaggeration—and ... a very effective form of promotion". The book claimed that "people want to believe that something is the biggest and the greatest and the most spectacular." The ghostwriter of the book, Tony Schwartz, said he coined that phrase and claimed that Trump "loved it". Conway later defended her remarks in an interview published in March 2017: "Two plus two is four. Three plus one is four. Partly cloudy, partly sunny. Glass half full, glass half empty. Those are alternative facts." In a radio interview with Mark Simone that was described by Salon in February 2018, she claimed that professional fact-checkers tend to be political liberals and are "selecting what [they] think should be fact-checked...Americans are their own fact checkers. People know, they have their own facts and figures, in terms of meaning which facts and figures are important to them." These are not normal times. These are extraordinary times. And extraordinary times call for extraordinary measures. When you have a spokesperson for the president of the United States wrap up a lie in the Orwellian phrase "alternative facts".... When you have a press secretary in his first appearance before the White House reporters threaten, bully, lie, and then walk out of the briefing room without the cojones to answer a single question... Facts and the truth are not partisan. They are the bedrock of our democracy. And you are either with them, with us, with our Constitution, our history, and the future of our nation, or you are against it. Everyone must answer that question. The New York Times responded with a fact check of statements made during Spicer's press conference. This included a side-by-side photographic comparison of the crowds from Obama's 2009 inauguration and that of Trump. Journalist and former New York Times executive editor Jill Abramson characterized Conway's comments about alternative facts as "Orwellian newspeak", and said "'Alternative facts' are just lies". NBC News quoted two experts on the psychology of lying who said that the Trump administration was engaging in gaslighting, and reported that the website alternativefacts.com had been purchased and redirected to an article on the subject. The Merriam-Webster dictionary website reported that lookups for the word "fact" spiked after Conway used the phrase "alternative facts". They also got involved by tweeting about it: "A fact is a piece of information presented as having objective reality." The tweet included a link to their article about Conway's use of the term. 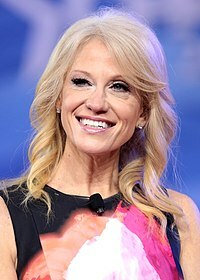 Following Conway's Meet the Press interview and the viral response on social media in which "alternative facts" was likened to Newspeak, a term from George Orwell's dystopian novel 1984, sales of the book increased by more than 9,500 percent, rising to the number one best-selling book on Amazon.com. The New York Times and others attributed this to Conway's statement. Penguin, the book's publisher, ordered a 75,000 unit reprint to meet demand. On January 24, 2017, the Public Relations Society of America, a public relations trade group, put out a statement that said "Encouraging and perpetuating the use of alternative facts by a high-profile spokesperson reflects poorly on all communications professionals." In a Breitbart News article dated January 23, 2017, editor Joel Pollak defended Conway's use of "alternative facts" by arguing that it was a harmless and accurate term in a legal setting, "where each side of a dispute will lay out its own version of the facts for the court to decide." The Guardian noted that "[a] search of several online legal dictionaries, however, did not yield any results for the term." A week later, the conservative daily magazine American Thinker argued that the "tidal wave of derision hoisted [sic] upon President Trump's senior adviser" had been rather shocking to observe because the derision had been "so spectacularly off base". The magazine asserted that the phrase "alternative facts" was in common use in law and that it was known to most lawyers, including Conway, with her George Washington University Law School degree, adding that, "it seems eminently possible that Ms. Conway knew exactly what it was she was saying." After giving examples of legal and non-legal uses of the phrase "alternative facts", the article contended that when Chuck Todd upbraided Kellyanne Conway with the claim that "alternative facts are not facts; they're falsehoods", he was not only wrong, but "propagating an ignorance born out of lazy and shallow thinking". On February 23, 2017, fifteen professors of law, some of whom are themselves obliged to adhere to the District of Columbia Bar Association's Rule of Professional Conduct, rule 8.4(a), filed a disciplinary complaint with the D.C. Bar's Office of Disciplinary Conduct. Their complaint applies against Conway, a lawyer in public office, on the grounds that under rule 8.4(c): "It is professional misconduct for a lawyer to engage in conduct involving dishonesty, fraud, deceit, or misrepresentation", because of Conway's pattern of misrepresentation as well as her misuse of words such as "massacre" at a time when she holds high public office. The letter of complaint makes a specific reference to the use of the phrase "alternative facts" as being involved in one of the cases of alleged misconduct, citing as a reference for its claim an opinion article by a New York Times Op-Ed columnist. The term alternative facts has become a mainstay in popular culture, from late night comedians to more serious news outlets. Jimmy Fallon created a segment "Two Truths and an Alternative Fact" on The Tonight Show. Stephen Colbert criticized Conway for saying she was not Inspector Gadget or "in the job of having evidence" on The Late Show, claiming "Kellyanne Conway has only one move: 'Go, go, alternative facts!'" CNN's ad campaign "Facts First" was a direct response to the concept of alternative facts and fake news. USA Today listed it in their "Glossary of Trump terms." Both Robert De Niro and Steven Spielberg referred to alternative facts in their speech at The National Board of Review awards for the Spielberg film The Post. "We are in a fight and it's a fight not just about alternative facts but it's a fight for the objective truth" said Spielberg after accepting the award. The 2017 short film Alternative Math is a satire about the absurdity of the concept of alternative facts. On January 16, 2018, German linguists declared the phrase "alternative facts" the non-word of the year 2017. It was also chosen by Austrian linguists as the non-word of the year in December 2017. ^ a b Blake, Aaron (January 22, 2017). "Kellyanne Conway says Donald Trump's team has 'alternative facts.' Which pretty much says it all". The Washington Post. Retrieved January 22, 2017.
de Freytas-Tamura, Kimiko (January 25, 2017). "George Orwell's '1984' Is Suddenly a Best-Seller". The New York Times. Retrieved January 26, 2017. Calfas, Jennifer (January 24, 2017). "Sales of '1984' surge after Conway talks 'alternative facts'". The Hill. Retrieved January 24, 2017. Koh, Elizabeth (January 24, 2017). "George Orwell's '1984' surges in sales after 'alternative facts' comment". The Kansas City Star. Retrieved January 24, 2017. Kakutani, Michiko (January 26, 2017). "Why '1984' Is a 2017 Must-Read". The New York Times. Retrieved January 26, 2017. ^ a b c Nuzzi, Olivia. "Kellyanne Conway Is the Real First Lady of Trump's America". Daily Intelligencer. ^ a b Cillizza, Chris (January 21, 2017). "Sean Spicer held a press conference. He didn't take questions. Or tell the whole truth". The Washington Post. Retrieved January 22, 2017. ^ Stelter, Brian (January 21, 2017). "White House press secretary attacks media for accurately reporting inauguration crowds". CNN. Retrieved January 21, 2017. ^ Wallace, Tim; Yourish, Karen; Griggs, Troy. "Trump's Inauguration vs. Obama's: Comparing the Crowds". The New York Times. ^ Mijnssen, Ivo (January 23, 2017). "Die Parallelwelt des Trump-Teams: "Alternative Fakten sind Lügen"". Neue Zürcher Zeitung (in German). Retrieved January 25, 2017. ^ "Alt-fact: Trump's White House threatens war on media over 'unfair attacks'". Haaretz. Reuters. January 22, 2017. Retrieved January 23, 2017. ^ Fandos, Nicholas (January 22, 2017). "Fact-checking the White House 'alternative facts'". The Seattle Times. Retrieved January 23, 2017. ^ Qiu, Linda (January 21, 2017). "Donald Trump had biggest inaugural crowd ever? Metrics don't show it". Politifact. Retrieved February 2, 2017. ^ @Metro (January 2017). "Metro Ridership: As of 11am, 193k trips taken so far today. (11am 1/20/13 = 317k, 11am 1/20/09 = 513k, 11am 1/20/05 = 197k) #wmata" (Tweet) – via Twitter. ^ "President Trump's Spokesman Just Lied About The Size Of The Inauguration Crowd". BuzzFeed. January 22, 2017. Retrieved January 22, 2017. ^ "Conway: Trump spokesman gave 'alternative facts'". New York Post. January 22, 2017. ^ Graham, David (January 22, 2017). "'Alternative Facts': The Needless Lies of the Trump Administration". The Atlantic. Retrieved January 22, 2017. ^ Swaine, Jon (January 22, 2017). "Trump presidency begins with defense of false 'alternative facts'". The Guardian. Retrieved January 22, 2017. ^ Bennett, Brian (January 22, 2017). "Trump aides defend inflated inauguration figures as 'alternative facts'". Los Angeles Times. Retrieved January 22, 2017. ^ Grynbaum, Michael M. (January 23, 2017). "Sean Spicer, Trump's Press Secretary, Reboots His Relationship With the Press". The New York Times. Retrieved January 24, 2017. ^ Berger, Judson (January 23, 2017). "Spicer Changes Up Format at WH Briefings, Moves to Hit Reset with Press". Fox News Channel. Retrieved January 24, 2017. ^ Wolff, Michael (January 26, 2017). "A Conversation With Kellyanne Conway: "I'm the Face of Trump's Movement"". The Hollywood Reporter. Retrieved January 27, 2017. ^ Hoefer, Hayley (February 3, 2017). "Kellyanne Conway's 'Alternative Facts'". U.S. News & World Report. Retrieved February 3, 2017. ^ Hjelmgaard, Kim (February 3, 2017). "Kellyanne Conway on Bowling Green 'massacre': I meant 'terrorists'". USA Today. Retrieved February 3, 2017. ^ Schmidt, Samantha (February 3, 2017). "Kellyanne Conway cites 'Bowling Green massacre' that never happened to defend travel ban". The Washington Post. Retrieved February 3, 2017. ^ a b Page, Clarence (January 24, 2017). "Column: 'Alternative facts' play to Americans' fantasies". Chicago Tribune. Retrieved January 25, 2017. ^ Micek, John L. (January 22, 2017). "Memo to Kellyanne Conway, there is no such thing as 'alternative facts': John L. Micek". Penn Live. Retrieved January 25, 2017. ^ Werner, Erica. "GOP Congress grapples with Trump's 'alternative facts'". The Detroit News. Associated Press. ^ Mayer, Jane (July 25, 2016). "Donald Trump's Ghostwriter Tells All". The New Yorker. Retrieved January 25, 2017. ^ May, Charlie (February 1, 2018). "Kellyanne Conway: The American people "have their own facts"". Salon. Retrieved February 2, 2018. ^ "Dan Rather takes to Facebook to blast President Trump's 'alternative facts'". Tampa Bay Times. January 22, 2017. Retrieved January 22, 2017. ^ Calfas, Jennifer (January 22, 2017). "Dan Rather on Trump: 'These are not normal times'". The Hill. Retrieved January 22, 2017. ^ Rather, Dan (January 22, 2017). "Dan Rather Facebook post". Facebook. Retrieved January 22, 2017. ^ Fandos, Nicholas (January 22, 2017). "White House Pushes Alternative Facts. Here Are the Real Ones". The New York Times. Retrieved January 22, 2017. ^ Abramson, Jill (January 23, 2017). "Sorry, Kellyanne Conway. 'Alternative facts' are just lies". The Guardian. Retrieved January 23, 2017. ^ Fox, Maggie (January 25, 2017). "Some Experts Say Trump Team's Falsehoods Are Classic 'Gaslighting'". NBC News. Retrieved February 7, 2017. ^ Melvin, Don; Calabrese, Erin (January 27, 2017). "Alternativefacts.com Links to Magazine Story About Gaslighting". NBC News. Retrieved February 7, 2017. ^ Sarkis, Stephanie (January 22, 2017). "Gaslighting: Know It and Identify It to Protect Yourself". Psychology Today. Retrieved February 7, 2017. ^ a b Merriam-Webster Trend Watch (January 22, 2017): "Conway: 'Alternative Facts' Lookups for 'fact' spiked after Kellyanne Conway described false statements as 'alternative facts'" Retrieved January 23, 2017. ^ @MerriamWebster (January 22, 2017). "A fact is a piece of information presented as having objective reality" (Tweet) – via Twitter. ^ Kircher, Madison Malone (January 23, 2017). "The Dictionary Attempts to Remind Kellyanne Conway What the Definition of 'Fact' Is". New York Magazine. Retrieved January 31, 2017. ^ Raphelson, Samantha (January 26, 2017). "The Merriam-Webster Dictionary Has Been Trolling Trump On Twitter For Months". NPR. Retrieved January 31, 2017. ^ a b Andrews, Travis (January 25, 2017). "Sales of Orwell's '1984' spike after Kellyanne Conway's 'alternative facts'". The Washington Post. Retrieved January 25, 2017. ^ Shen, Lucinda (January 25, 2017). "The Publisher of '1984' Just Ordered a Massive Reprint for the Age of 'Alternative Facts'". Fortune. Retrieved January 25, 2017. ^ Goodman, Jessica (January 25, 2017). "1984 hits No. 1 on Amazon after Kellyanne Conway's 'alternative facts' quote". Entertainment Weekly. Retrieved January 25, 2017. ^ "PRSA Statement on "Alternative Facts"". The Public Relations Society of America. January 24, 2017. Retrieved January 25, 2017. ^ Conway, Madeline (January 2, 2017). "Public relations association rebukes Trump's White House on 'alternative facts'". Politico. Retrieved January 25, 2017. ^ Gabbatt, Adam (January 23, 2017). "Even rightwing sites call out Trump administration over 'alternative facts'". The Guardian. ^ Allison, David (February 2, 2017). "'Alternative facts': A common legal term". American Thinker. Retrieved February 12, 2017. ^ "Jimmy Fallon Offers His Own 'Alternative Facts'". ^ "Conway: I'm not Inspector Gadget". ^ "Stephen Colbert mocks Kellyanne Conway". ^ "CNN - "This is an Apple" ad". ^ "'Alternative facts' to 'witch hunt': A glossary of Trump terms". ^ "Robert De Niro Mocks President Trump in Profanity-Laced Tirade at NBR Awards". ^ Knecht, Lyndsay; Lester, Demetria (November 24, 2017). "Watch Three Subversive Comedies For Free Online". D Magazine. Retrieved July 8, 2018. ^ "'Alternative Facts' Is 2017's Non-Word of the Year, German Linguists Declare". ^ ""Vollholler" zum rot-weiß-roten Wort des Jahres gewählt". Die Presse (in German). Retrieved January 18, 2018. Look up alternative fact in Wiktionary, the free dictionary.